Finish of the 4×100 relay. Wayne qualified for the finals in the 4×100 relay. First leg of the 4×100 relay. Start of the 4×400 relay. Madison Doss gets a good start. Madison Doss competes in the 400. Madison Doss erupts from the starting blocks. COLUMBUS — On opening day of the Division I state track meet on Friday at The Ohio State University, two Wayne High School runners qualified for the state finals on Saturday. In the 400-meter dash, Wayne junior Madison Doss ran a 56.49 to qualify for the finals on Saturday at the state track meet. She has the fourth fastest time and will compete in the finals on Saturday at 5:45 p.m.
Wayne’s 4×100 relay, composed of Alonzo Johnson, Hadith Tiggs, Tyree Kinnel and Ahmad Wagner ran a 42.28 on Friday to qualify for the finals on Saturday at the state track meet. They have the third fastest time and will compete at 5:30 p.m. on Saturday. 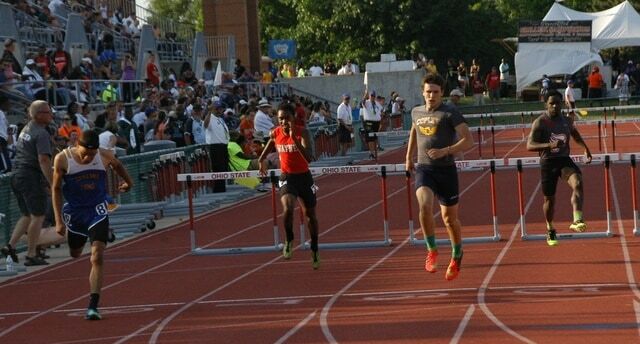 Damon Roberts season came to an end on Friday at the state track meet in the 300-meter hurdles as he had the 14th fastest time in the prelims with a 39.806. Robert Landers seeks to defend his state title from last year in the shot put at noon. He will also compete in the discus at 3 p.m.